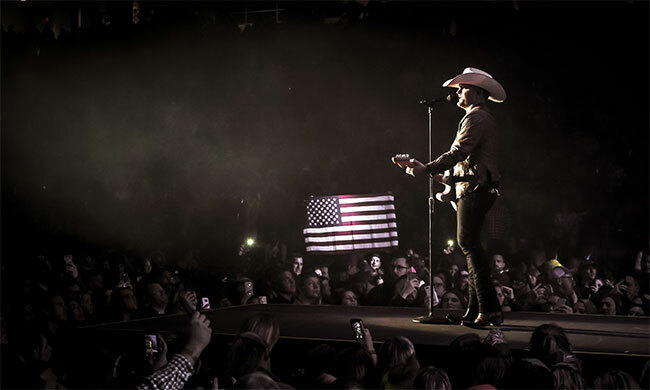 The Valory Music Co. artist Justin Moore will perform “The Ones That Didn’t Make It Back Home” at the 15th Annual National Memorial Day Parade on Monday, May 27th, live from Washington D.C. The National Memorial Day Parade is the largest Memorial Day parade in the nation. It draws more than 250,000 spectators on-site, and millions more will watch the televised broadcast on ABC/CBS/NBC/Fox affiliate stations (check local listings) and streamed online via YouTube and Military.com. Additionally, the parade will broadcast to Americans serving overseas via the American Forces Network. Moore’s current single is the first from his forthcoming Late Nights and Longnecks album due July 26th. It honors those who serve in the military, as police officers, fire-fighters, first-responders, teachers and nurses. “The National Memorial Day Parade is a great opportunity for Americans to put aside our differences and disagreements and unite around the remembrance of brave men and women who’ve sacrificed everything to ensure our freedom,” says Tim Holbert, Senior Vice President of American Veterans Center. The National Memorial Day Parade is a moving timeline of America’s military history, honoring those who have served to protect our country from the American Revolution to today. On Monday, May 27th, pedestrians will line the National Mall to pay tribute to those who have served and sacrificed for our country, and more than five thousand people will participate in the parade, including veterans and active duty military personnel, historical re-enactors, marching bands, musical performers, and celebrity supporters of our troops. This year marks the 75th Anniversary of D-Day. Therefore, the parade is welcoming dozens of surviving veterans of World War II as Honorary Grand Marshals, including veterans who landed at Normandy, June 6, 1944.